Well into the Twentieth Century the slate industry of North Wales was the world’s largest. It roofed the buildings of the world and left a huge scar on the beautiful landscape of what is now the Snowdonia National Park. But that’s not all it left. If you visit Yr Amgueddfa Llechi Cymru – the National Slate Museum – outside the village of Llanberis you can tour the old buildings of the slate quarries, including the infirmary. 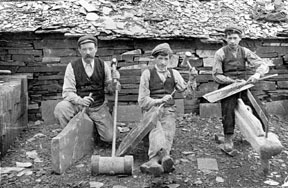 One of the human legacies of the industry was to bequeath workers, especially slate-splitters, with chronic and fatal respiratory illness from breathing in the slate dust created from dressing the raw material and turning it into usable roof slates. In oral accounts you can hear at the museum workers describe how the air in the slate dressing buildings was thick with dust. On the wall of the infirmary is a row of certificates signed by medical doctors. These documents certify that not only is slate dust not the cause of respiratory illness, it is actually promotes good health. If you ever happen to be visiting North Wales, go and have a look. My forebears worked in the Dinorwic quarries near Llanberis and so there is a family, if not a personal reason to feel a little affronted by the lie perpetrated by people who could have known and almost certainly did know better. The lie they told on the walls of the infirmary and in their supposedly professional diagnoses condemned many, many people to a slow and painful death. Slate dust was not safe. It was obviously not safe. Anyone who worked in it could have known and did know that. And yet profit was to be made by avoiding and denying the obvious.